About 10 years ago I did quite a bit of reading on the impact that spatial layouts of laboratories had on the way human beings carried out innovations in those spaces. By far the most interesting work I found was that of Alan Penn and co-workers in the Space Syntax lab in University College London (UCL). One of the seminal books in this field was Space is the Machine written by Bill Hillier of UCL. The whole book is now available for downloading HERE. 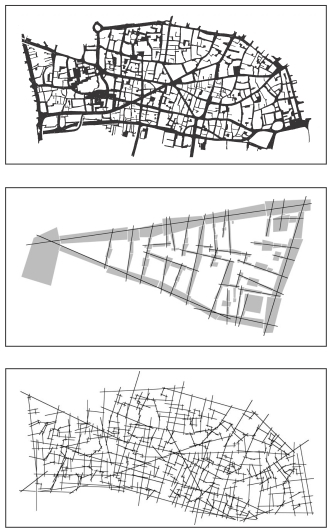 Below is one of their graphical analyses of the space between the buildings in the City of London today and in 1677. The phrase 'Space is the machine' arose in the following manner (reported in the beginning of the book). Nick Dalton, Computer Programmer at University College London (1994).